Did anyone elses post count randomly drop by about 50? Did anyone elses forum post count randomly go down by approximately 50 recently? that seems to have happened to me. Explanation please, if anyone has one. Did some archive get deleted or something like that? That's what I thought but it seems strange that there was a whole lot all at once. Did anyone else notice this? Mine went down a bit..weird. 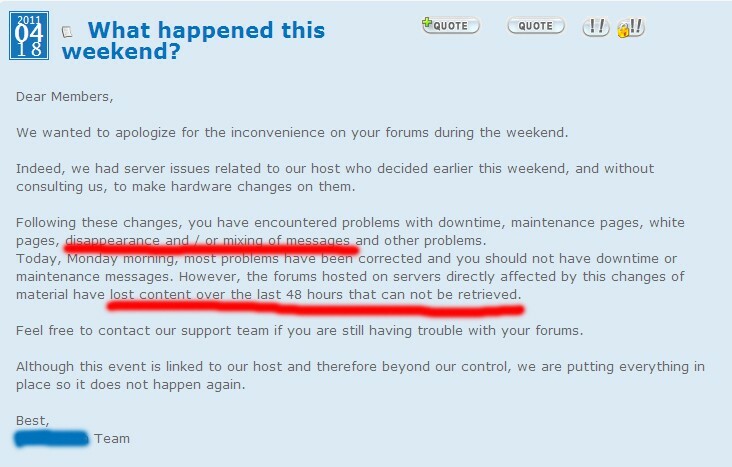 There was some kind of technical difficulties within the forum host. From now on, the threads won't get fucked randomly with red/brown/other colors. And I don't really know why do you care about your post count at all. Please point out where I said I cared. I just wondered what happened because it didn't seem right. I don't really pay much attention to it...not a post whore.